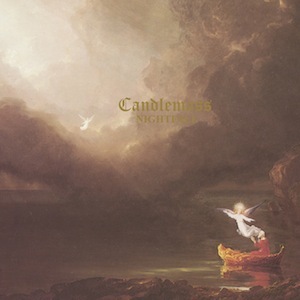 CANDLEMASS - NIGHTFALL VINYL (LP 180G BLACK) | Online Shop | Wizard LTD. Album: "NIGHTFALL VINYL (LP 180G BLACK)"
Black vinyl edition of the classic 1980&apos;s Candlemass album in a gatefold sleeve. Nightfall was the second Candlemass album, from 1987. Alongside first album Epicus Doomicus Metallicus this is hailed as an all-time Doom classic and was instrumental in shaping the Doom Metal scene that still exists 20 years on. Nightfall is often regarded as the definitive Candlemass album, and the pinnacle of the Epic Doom scene. On Nightfall, joining bass player and main songwriter Leif Edling was vocalist Jan Alfredo Marcolin, better known as Messiah Marcolin, who became a well established and highly regarded vocalist throughout the Metal world, with his unusual and theatrical tones. Nightfall is a continuation of the band&apos;s debut; more epic and melodic heavy doom, though the band were also not afraid to vary tempo on occasions, integrating faster elements to the compositions giving a more dynamic feel. Nightfall truly helped define the genre and paved the way for Doom Metal&apos;s future, with the album featuring in members of My Dying Bride&apos;s top albums of all time.